Poway - A city in the country! Poway officially became a city on December 1, 1980 and is known as “The City in the Country”. With a population of over 50,000 people, Poway has grown into a very unique community. This city is located in North County Inland, just east of Interstate 15 about 20 minutes north of Downtown San Diego. From affordable housing to spacious multi-million dollar homes, Poway has a diverse range of housing options. The city of Poway is a great place to live, work, play or visit. This community has so much to offer residents or visitors with a broad range of dining and shopping opportunities, an active business park, excellent schools (rated number 1 school district in San Diego County), and a plethora of community events throughout the year. From parks, miles of open space, and over 80 miles of trails, this community has something to all to enjoy. With its proximity and easy commute to Downtown San Diego, this quick trip is traveled quite frequently by residents. When you want the atmosphere of a metropolitan city, or the variety of hundreds of restaurants in the Gaslamp District, it won’t take you long to travel from the country of Poway to the big city of San Diego. One of the most popular attractions in Poway is Iron Mountain. This six-mile round trip hike, with varying degrees of ups and downs, has scenery that’s ever changing at every turn. Sometimes you’ll see the occasional jogger or runner but you’ll always see people hiking . . . with their friends, their families or even their dogs. Besides Iron Mountain, Poway has over 65 miles of hiking trails. These trails vary in length and difficulty and some even provide incredible lake views. Take for instance the Lake Poway Loop Trail, a 2.75 mile trail around Lake Poway. The Sumac Trail and the Lake Poway to Blue Sky Trail are both only 1.5 miles of hiking trails and good for all skill levels. There’s also the Mount Woodson Trail, a very steep trail, which is not recommended for beginners. If hiking isn’t your forte, but you still enjoy the outdoors, you’ll be pleased to find the Maderas Golf Club. This Johnny Miller masterpiece has been rated the top Golf Course in San Diego County for seven consecutive years by Zagat Survey. It’s beautifully designed with cliffs that wind through the course, creeks, and forests all around. If you have a family who interested in sports, or simply love being a spectator, then don’t miss Poway Sportsplex USA. From baseball, soccer to softball, and even four slow-pitch softball batting cages, this family-friendly state of the art Sports and Recreational Facility has something for everyone. There are homes for all types of buyers. Single family detached, ranch style, condominiums, townhomes and luxury estates. Prices range from $250,000 to several million dollars. 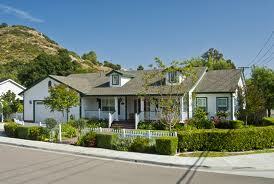 Most of the homes in Poway are located close to restaurants, shopping, schools, sporting activities, lakes and trails. Come check it out, you won’t be dissapointed!